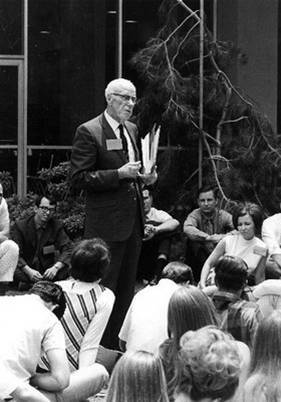 Kenney Carl Moser (1893-1976) was one of the most significant players in the theological arena of Churches of Christ in the twentieth century. My friend Bobby Valentine has recently demonstrated in a paper delivered at the 2007 Christian Scholar’s Conference at Rochester College (entitled “In with Wallace, Out with Brewer: K. C. Moser in the 1920s”) that K. C. Moser grew up in a solidly Texas tradition which was the right wing of Southern Churches of Christ at the turn of the century. I was uncertain of this in my original material and speculative about when he might have undergone a significant shift, but Bobby has convinced me. He discovered Moser’s contributions to a small periodical entitled the Herald of Truth in the early 1920s that clearly locates him in the Firm Foundation theological orbit. Moser was born and bred in the Texas tradition, but he began to shift to a more gracious position. Bobby has further convinced me that this movement toward the Tennessee tradition was directly related to his changing understanding of spirituality, particularly the presence and function of the Spirit of God in the believer. This underlies his shifts on grace, faith, justification and sanctification. By the early 1930s Moser was no longer writing for the Firm Foundation but was a weekly contributor (even on staff for a while) to the Gospel Advocate. Bobby’s work, which I hope he will soon publish, clarifies Moser’s theological shifting in the 1920s and prepares us to better understand the controveries of the 1930s and 1950s. This shift was even unwelcome at the Advocate in 1933 as Foy E. Wallace (a Texas advocate and one time cohort of Moser) removed Moser from the staff of the Advocate. Moser was regarded as a traitor to his old haunts. He was regarded as no better than a Baptist in Church of Christ clothing, especially in the light of his 1932 book The Way of Salvation. He was definitely an “outsider” in many ways in the 1930s and 1940s though befriended by key persons such as G. C. Brewer. By the 1950s, however, he was a breath of fresh air in the midst of ecclesiological fights over institutionalism (e.g., may churches support human institutions out of their treasuries?). His tract Christ Versus a “Plan” (1952) would set an agenda for future discussion that ultimately culminated in Moser’s theological commentary on Romans entitled The Gist of Romans (1957). The perfectionistic disputes of the 1950s disillusioned some and Moser’s theology of grace began to resonate with younger ministers. By the early 1960s Moser’s views were most characteristically described as an emphasis on the man (Jesus) rather than the plan (the five steps of salvation). He even taught at Lubbock Christian College from 1964-1972 where he had a tremendous impact on some young minds–both pro (scroll down to the letter from an elder in Texas) and con (scroll down to Tommy Hicks’ article). His influence continued into the 1970s and 1980s–even among young non-institutional ministers. Moser, I believe, was one of the key players–if not the most important one–in renewing a theology of grace among Churches of Christ in the midst of polemical exchanges that amounted to ecclesiological perfectionism. Contemporary ministers within Churches of Christ owe a great debt to the perseverance and courage of K. C. Moser who taught a theology of grace when it was quite unpopular and regarded as treason. I have uploaded to my Academics page my three major contributions to the study of K. C. Moser. The foundational document is my lecture for the 18th Annual W. B. West, Jr. Lectures for the Advancement of Christian Scholarship in October, 1993, at Harding University Graduate School of Religion entitled The Man or the Plan? K. C. Moser and the Theology of Grace Among Mid-Twentieth Century Churches of Christ (also available at Hans Rollmann’s Restoration Movement webstite). From this material I subsequently published two articles in the 1995 Restoration Quarterly. The first provided the historical context of Moser’s ministry and writing. The second article offered a theological assessment of the significance of Moser’s perspectives. Not everyone, of course, agrees with my positive assessment of Moser. Just as the Texas Tradition opposed Moser in the late 1920s and early 1930s, and then opposed his reemergence in the late 1950s and 1960s, many continue the opposition today. Some even place him at the center of the disintegration of unity (read: conformity) among Churches of Christ. The Firm Foundation, in an article by Joseph A. Meador, parallels Moser’s supposedly divisive teaching with contemporary change agents and Dub McClish recently noted that that Moser’s “dormant seeds” have again sprouted. The cleavage between the Texas and Tennessee traditions still exists within Churches of Christ. I believe the life and theology of this godly man is worth careful consideration–not simply from a mere historical vantage point but more importantly from the need to recontexualize his Christ-centered theology for the present. We stand on his shoulders and I am grateful for his life-long struggle to proclaim the gospel of grace in the midst of a people who resisted his message. This entry was posted on May 15, 2008 at 5:32 am	and is filed under Stone-Campbell, Theology. Tagged: Atonement, Baptism, Churches of Christ, David Lipscomb, Faith, Firm Foundation, Foy E. Wallace, G. C. Brewer, Gospel Advoate, Grace, Guy N. Woods, Holy Spirit, Justification, K. C. Moser, Nashville Bible School, R. L. Whiteside, Sanctification, Stone-Campbell, Tenessee Tradition, Texas Tradition, Works. You can follow any responses to this entry through the RSS 2.0 feed. You can leave a response, or trackback from your own site. In a class I had with Jimmy Allen during my undergraduate studies, he credited K.C. Moser and his book “The Gist of Romans” with having the biggest influence upon his understanding of God’s grace. the tunnel vision of the 20th. cent. restoration. the way that this man was treated was shameful. Actually it was a grudging acknowledgement offered without pleasure and with great envy…. I will second CONSTANT’s sentiment – it was and continues to be a disgrace how those who break with tradition are treated throughout our fellowship. Excellent reading and I wonder 9 years later when people speak about the way Moser was treated is shameful, its a disgrace, etc, that many people have broken away from CoC right wing traditions. This has unfortunately happened to many times, that great Christians who decide to buck the traditions of the right wing churches are ostracised. In effect, displays that many lack to renew their minds and rely on their traditions as the truth. Just a great pity. At 34 years old, I am just now discovering Moser and the history around the COC in his day. Faith shifting it is indeed. I had heard of him growing up as a preachers kid, but did not realize his significance untill a few yrs ago. when you take perfect law of liberty and use it as a tool of judgment, do you not set yourself up to be a hypocrite. And in so doing become counterproductive to the unity that God expects us to find in the love of Christ. Obedience of faith: the faithfulness of Christ. The divine nature, the new creation. I will say one thing I am learning not to throw rocks because I know I in a glass house. it’s time for the Neoplatonist’s to come out of the cave and start asking the right questions the way Socrates told everybody to do. I decided to delete the question. The answers are there, if our hearts in the right place. Throwing rocks and glass houses is a good analogy for the hermeneutical process in which we are all engaged. As we seek to understand, enjoy and proclaim the grace of God, we need to demonstrate grace to others who have the same goal in mind. Moser’s two books were foundational to me back in the late 60’s and early 70’s. I credit him with my earliest understanding of Grace and the beginning of my journey out of legalism..
As a firm C-L-P evangelist (conservative in theology, liberal in love, progressive in ministry) who has worked among Stone-Campbell churches since early teenage years and went to one of the “brotherhood’s” more conservative schools, I am sad to say I found out about Brewer only through him being treated as the enemy and a change agent of the distant past. When you read his work, however, he was years ahead (or should we say 1850 years behind) his time. God bless his legacy among us and all believers who seek unity and salvation in grace through faith. Brewer, in many ways, fits the CLP categorization. He was quite conservative on most ecclesial issues, but quite progressive in methods (multiple cups, located-salaried preachers, sponsoring churches for missions, large building programs, etc.). He and Moser were quite a pair. They were both conservative, but conservatives with a strong theology of grace though both held a strong ecclesial patternism that did not give much room for grace at the corporate level. Thanks for chiming in. I, too, had not heard much of Brewer in my conservative training which was soaked in the Texas tradition. Thanks for your work on K.C. Moser, he happens to be my great grandfather. Unfortunately, I’m just now learning of his great influence. I’m proud to continue in the tradition of his theology of grace, and I’m eager to learn more. Any other resources are appreciated. I was a student of Brother Moser’s at LCC (now LCU). I was also blessed to be befriended by him at a personal level. Both experiences were monumental in my development as a young minister, and continue to largely shape my thinking today. As many of you probably know, Christian college Bible classes can be rather tedious (dare I say it, boring) … but I found his classes to be rich and inspiring, especially one on the Gospel of John. Thanks, Keith, for your comment. It is good to hear from those personally impacted by Moser. hey, brother. just doing some late night reading on “unity” and ran across a quote from K.C. Moser, and ended up here! will have to read more on KCM. He sounds like somebody I’d like to read. Knew his name, but that was about it. Thanks. Jerry. Jim Massey was a student of Moser. I was graced to be a student of Massey. His class on Romans saved me.